Scott Laidlaw is slowing down the pace on educational math games. Laidlaw, who is CEO and co-owner of Imagine Education, created Ko's Journey to help teach math to middle schoolers using a rite-of-passage story he heard while traveling in Peru. Now, with a $500,000 grant, he's taking the computer game across the country and helping teachers integrate it into their core curriculum. The grant allows Laidlaw to travel to ten middle schools across the United States, with a film crew who will create a video version of the journey. The resulting documentary will be released to every middle school in the country by next April. Ko's Journey is not Laidlaw's first educational game—not by a long shot. He taught in middle schools for six of his 11 years as a teacher, and frequently created low-tech games for his students. It all started with a gigantic write-on map from Skymall, which Laidlaw used to teach his students about the spice trade. Laidlaw applied the ideas from this first game to create a variety of others like it, from prospecting maps about the Wild West to early trade ideas in ancient civilizations. The games got so much use he had to replace them as they fell apart. Often the new copy of the game incorporated requests and ideas students had come up with while playing the original. 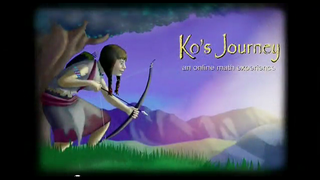 Ko's Journey had low-tech roots, as well; it was so popular among students that Laidlaw began developing the computer version of the game five years ago. Two things set Ko's Journey, and all of Laidlaw's games, apart from other classroom games: The use of storytelling, and the pace of the game. Students solve problems so well integrated into the story of these games that they may not even notice they're being drilled on core concepts. In fact, the game incorporates concepts typically not introduced to students until the ninth grade, but they are so caught up in continuing the story that they welcome the extra challenge. This verbal approach to mathematics can make the subject more accesible for students who learn better in a non-linear way. The storyline also slows down the game's pace, which sets it apart from other math games where speed and repetition are rewarded. Laidlaw hopes that this will "allow for imagination and mathematical thinking to arise." The slower pace makes the game more enjoyable and can even have a calming effect on the students who are playing it. Alicia Bomhoff, a math teacher at Taos Academy, observed this effect in her own classroom, "A lot of students use Ko's journey to slow down, and relax, and actually enjoy math." The game has been available since last summer, and already the results of playing it are evident in students' standardized test scores. The scores were on Laidlaw's mind while developing the game, which he says was created "in the heat of the teaching environment". The results are reflected in student scores on the MAPs, or Measures of Academic Progress tests, which are standardized tests for middle schoolers in West Virginia. Students who played Ko's Journey, on average, scored 50% higher on the MAPs than those who didn't play. Laidlaw is taking his experience with Ko and applying it to his next game. Empires, currently in development, will base its storyline in Mesopotamia. Its educational goals are to reinforce math skills and financial literacy. Laidlaw hopes to use a $1,000,000 grant from the U.S. Department of Education to develop and distribute the game.